Karen Luebbert, Adam Neal and Angela Murphy will be inducted into the Webster University Student Life Hall of Fame during Homecoming weekend in September. 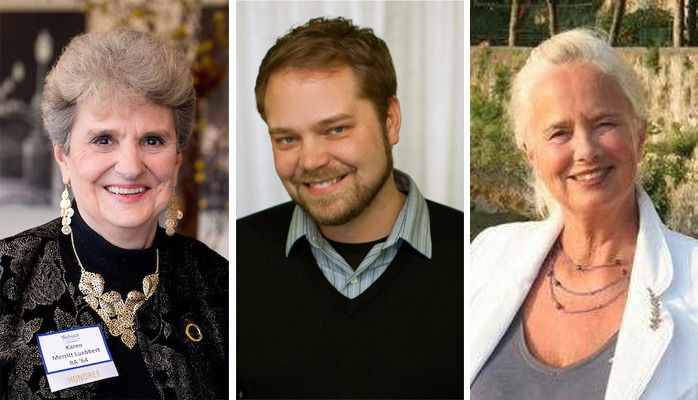 Karen Luebbert ’64, Adam Neal ’02 and Angela Murphy, retired in 2014, have been selected as the newest members of the Webster University Student Life Hall of Fame. They will be inducted at a ceremony to be held during Homecoming Weekend in September 2016. A perpetual plaque and photos of the inductees will be displayed in the University Center. Karen Luebbert graduated in 1964 with a BA in English. Karen was heavily involved in student leadership positions on campus, including such highlights as serving as president of the Student Government Association, editor of the Lorentine (literary magazine), junior class vice president, editor of the Campus Guide, reporter for the Web student newspaper, creator of the Student Handbook, and providing leadership for the All-School May Crowning, a capital gift fundraising campaign to solicit 100 percent student contributions. Luebbert went on to earn a master’s in library science at Case Western Reserve University, and a PhD from Saint Louis University. She joined Webster as an employee in 1967, and went on to serve the University for 45 years in a variety of roles, from director of the library to vice president, executive assistant to the president, and board secretary, until her retirement in 2011. Luebbert played an active role in working with the vice president of Student Affairs Mark Govoni on the University Center building project and helping to facilitate the process that led to the construction of the Webster Village Apartments. She has also served as a tireless volunteer in the St. Louis community. She has served as Chair of the Missouri Association for Affirmative Action, the Diversity Awareness Partnership, The Missouri Library Network Corporatioon, St. Louis Regional Library Network, the Missouri Higher Education Loan Authority, and the Herbert Hoover Boys and Girls Club (now known the Boys and Girls Club of Greater St. Louis.) She also served on the boards of the St. Louis Journalism Review, Midwest BankCenter, the Higher Education Center of St. Louis, the University Club, VideoNine, Jefferson National Parks Association, Cathedral Concerts and Artist Presentation Society. Luebbert also served in leadership roles with the United Way of Greater St. Louis’s Women’s Leadership Giving initiative and Women’s Cabinet. Dr. Luebbert was inducted into the Incarnate Word Academy Hall of Fame and received the Mary Elizabeth Newell Award from the Webster University Alumni Association, both in 2011. In 2012, she was named the Webster University College of Arts & Sciences’ Outstanding Alumna. Adam Neal graduated in 2002 with a BA in film production. Adam served in a variety of leadership roles as an undergraduate, with highlights including: serving as resident assistant (RA) in housing for two years, program/project coordinator for resident life, president of the Media Association, producer for the Webbies (School of Communications award program), senator for the Student Government Association, member of Omicron Delta Kappa Leadership Honor Society, member of the Publications Board, member of the Media Advisory Board, member of the Residential Housing Honorary Society, and participant in WebsterLEADS. He also completed an internship in Los Angeles. Neal was selected to receive the Walker Award in 2002 as the graduating senior having the most significant combination of academic achievement and leadership involvement. His nominators for the Walker Award all commented on his organizational skills, positive attitude, and selfless leadership qualities. After graduation, Neal spent more than ten years in a variety of roles, such as producer and vice president of development, in Los Angeles producing hit television shows such as America’s Next Top Model, MasterChef, CBS’s Paula Abdul Dance Show Reveille, and NBC’s School Pride. He currently serves on the School of Communications Advisory Board and works as a development executive for RIVR media. He returned to St. Louis last year with his wife Stacey, also a former Walker Award winner, and their two children. Neal has had ongoing involvement with School of Communications alumni and has maintained contact with School of Communications faculty and administration for many years. Angela Murphy served as coordinator of student life and student services at the Webster Geneva campus until her retirement in 2014. For more than 25 years, she was responsible for all elements of student life in Geneva, including coordinating housing for students who studied abroad, coordinating with other campuses for students who planned to study at other Webster campuses, planning and facilitating new student orientation, overseeing student council, planning campus events, and taking students to the hospital when they were sick or injured. Murphy also worked with the faculty to plan campus lectures on important topics. In her last ten years, she was able to hire a student life colleague, and thus became the study abroad coordinator and director of Residential Life, where she opened and oversaw a new campus Living-Learning Center and coordinated the housing needs for students in the Geneva community at off-campus facilities. Murphy’s work with students helped put them immediately at ease upon landing in Geneva, not to mention the copious communication and follow-up with students leading up to their arrival. Her attention to detail, and significant care and concern for students was apparent in every interaction. She was always mindful of students’ needs at each stage of their college career. She made students feel comfortable and “at-home,” and she was an excellent planner. Her long-term positive impact on student life at Webster was her extraordinary commitment to students. Every decision she made, every negotiation she had with a local apartment owner, every event she planned, and every interaction she had with a student had the goal of helping students be successful in their Webster Geneva experience. If there was something that needed to be done for or on behalf of students, she was the “go-to” person to get it done. Outside of her work life at Webster, Murphy has been actively engaged in the international community in Geneva as a strong proponent of peace and international diplomacy. Former students, employees, and other individuals who have made significant contributions to student life at Webster University are eligible for selection to the Student Life Hall of Fame. Nominees must be graduates of Webster University, and have graduated at least two years prior, or were former Webster University employees who left the University at least two years prior to selection.